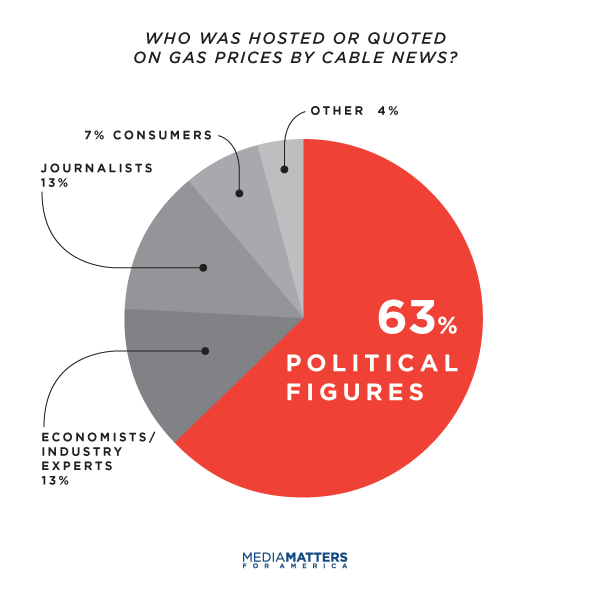 A Media Matters analysis of print and television coverage of rising gasoline prices between January 1 and February 29 finds that news outlets often provided a shallow and shortsighted treatment of the issue. For instance, several outlets largely overlooked fuel economy standards -- a key policy solution that mitigates U.S. vulnerability to price spikes -- while promoting increased U.S. drilling and the Keystone XL pipeline, which would likely move gas prices by only a few cents, if at all. In addition, cable news outlets primarily hosted political figures rather than energy experts or economists to comment on gas prices. Fox News, which covered gas prices far more frequently than any other outlet, regularly blamed President Obama for the recent price increase, a claim in line with Republican strategy but not with the facts. Michael Levi, Council on Foreign Relations: "Since oil is traded on a global market, the effects of volatility are reflected in the price of every barrel of oil regardless of its origin. This problem can be addressed only by making the U.S. economy more resilient to oil price swings, which includes -- most significantly -- lowering total U.S. oil consumption." Economist Severin Borenstein: "To fix the problem, we just need to use less oil." Energy analyst Chris Nelder: "Increasing efficiency is going to be a far more productive policy tool than increasing supply." Moody's Chris Lafakis: Higher average fuel economy, "be it through electric vehicles or improved efficiency on conventional vehicles," lowers "the percentage of consumers' incomes that they spend on gasoline." News Outlets Largely Overlooked Fuel Efficiency Policies. 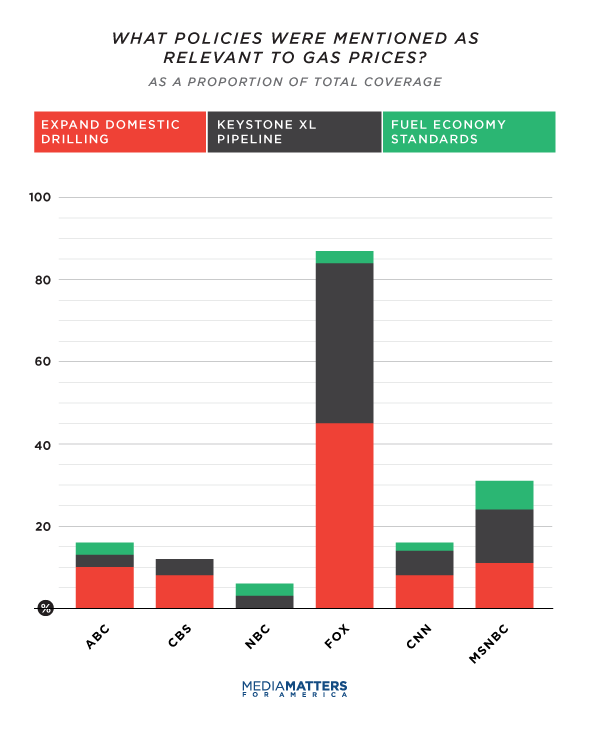 Only 2% of broadcast coverage, 4% of cable coverage, and 13% of print coverage of gas prices mentioned fuel economy standards, which have been significantly raised by the Obama administration. Two of the 9 mentions of fuel economy standards on Fox were GOP candidates calling for their repeal. CBS and The Los Angeles Times did not mention fuel efficiency standards in their gas price coverage at all. Out of 69 print items on rising gas prices, only three made the point that reducing oil consumption is the best long-term solution. These figures include views expressed by those interviewed or quoted. Experts Say It's Simply Bad Economics To Blame Price Spike On The President. As countless experts and fact-checkers have noted, global factors largely determine the price of oil, not U.S. policy changes, let alone any actions President Obama has taken. Nevertheless, More Than Half Of Fox News Coverage Falsely Suggested Obama Is Responsible. Our results show that Fox News covered gas prices far more often than other news outlets -- more than CNN and MSNBC combined. 55% of Fox News coverage suggested that President Obama is to blame for rising gas prices. 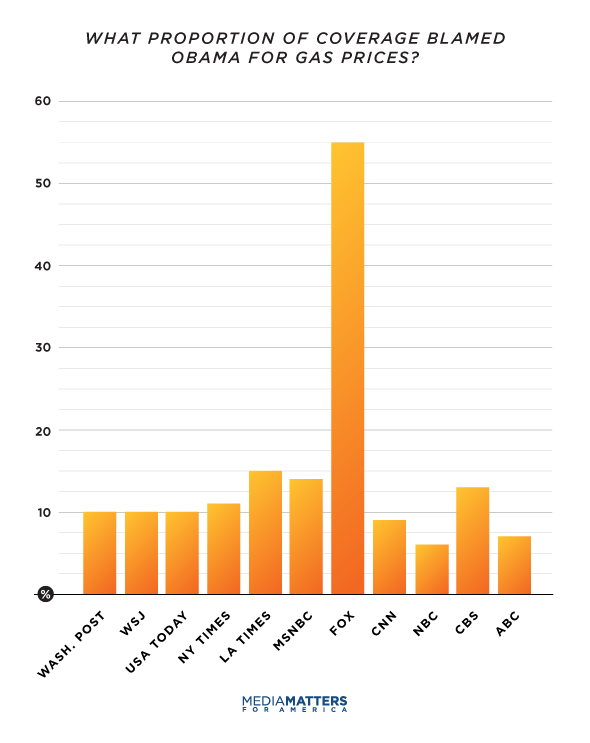 In total, Fox blamed Obama 144 times in two months - more than three times as much as all other news outlets combined. These figures include guest quotes if they were not challenged by the anchor or author. In a closed-door meeting last week, Speaker John A. Boehner instructed fellow Republicans to embrace the gas-pump anger they find among their constituents when they return to their districts for the Presidents' Day recess. "This debate is a debate we want to have," Mr. Boehner told his conference on Wednesday, according to a Republican aide who was present. This report analyzes print and television coverage of U.S. gasoline prices between January 1, 2012 and February 29, 2012. 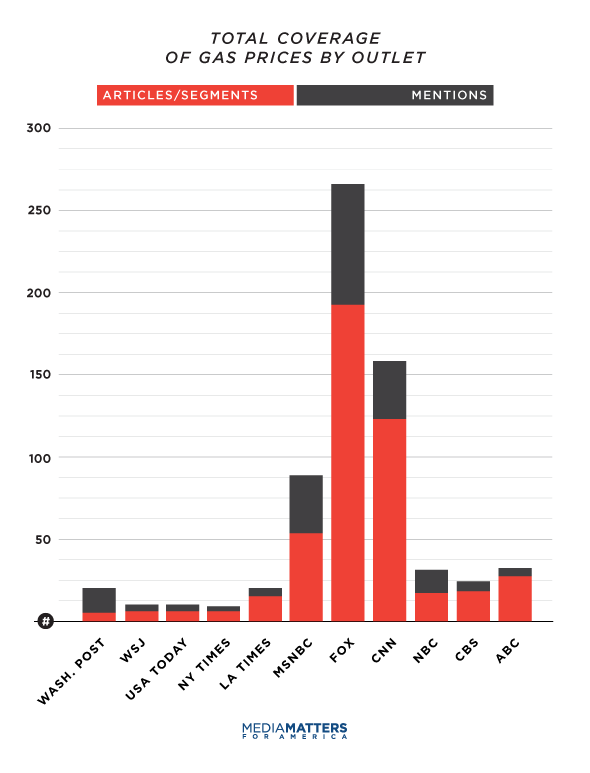 Our analysis includes the major broadcast networks (ABC, NBC and CBS), the major cable networks (CNN, Fox News, and MSNBC), and five major print outlets (New York Times, Washington Post, USA Today, Los Angeles Times, and Wall Street Journal).